You already played the first part of the game Fire and Water? Here is a new game with our favorite heroes of the game. This time fireboy and watergirl was in the crystal temple and you are going to pass all levels. And this is despite the fact that levels very much, and the puzzles harder and harder. How nice that you will help them to understand all the challenging levels and win the game! How to play: help the boy and girl pass each level as quickly as possible. Use the crystals to teleport and collect gems to earn maximum points at each level. Keep fireboy out of the water puddles and watergirl fell into a pit of fire. In addition, both characters don't like puddles of green slime. Game control: WASD - Water and the arrow keys - Fire. Check other fun 2 player games for girls at our site and enjoy it. Played: 33813. Added: 16-11-2015, 21:11. 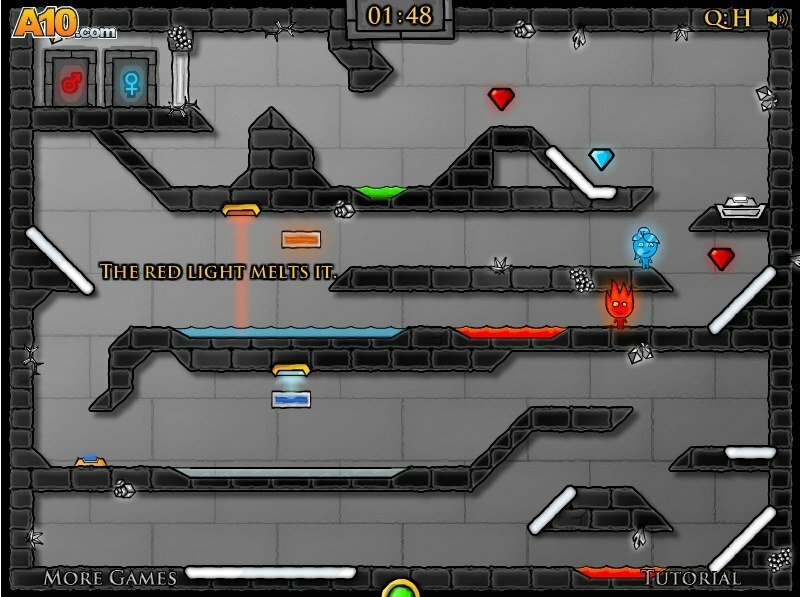 Fireboy & Watergirl 4: Crystal Temple game for 2 players.